Bathing and the very first swimming competitions came into fashion in the early 19th century as the prevailing body modesty of the 16th, 17th and 18th centuries was swept away by the Romantic Movement. Henley Swimming Club was formed in 1894 when river racing was at the height of its popularity. 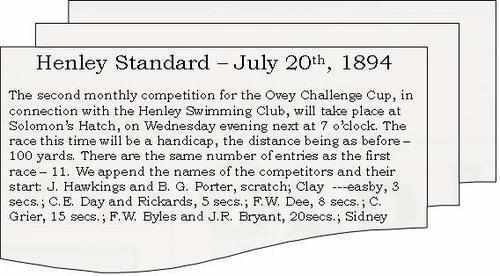 According to Emily Clemenson’s 1896 “Guide to Henley-on-Thames” it was formed “to encourage the most necessary accomplishment for all who love boating and fishing”The first president of the club was Mr R. Ovey, who lent his name to the Ovey Challenge Cup, a fiercely contested monthly race, which was reported in the Henley Standard. 50 years earlier, in 1844, the first international race was held in The Thames, which was won by an American swimming an ‘ungentlemanly’ variant of front crawl that stunned the British and spawned the formation of many of the earliest formal river swimming clubs to rise to the challenge. 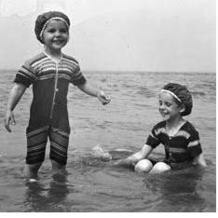 Increasing leisure activity, affluence, and the arrival of the railways all contributed to the rise in swimming and outdoor pursuits. By 1855 river swimming had become so popular that The Thames Preservation Act was specifically directed towards the preservation of the River above Teddington Lock for open water swimmers. and competed in an outdoor pool in the River Thames adjacent to the Wargrave Road in Henley – on an area of land known as Solomon’s Hatch. The pool was opened to the public from 6am to 8pm, and to ladies from 11am to 1pm. In common with many swimming clubs, Henley Swimming Club flourished until the early 20th Century, when the depression, the first world war and rising river pollution from increased industrial activity brought river swimming largely to an end. 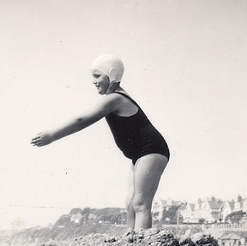 50 years later, in the 1970s a group led by Des Hopkins formed with the aim of providing Henley with a swimming pool. Des Hopkins worked with Henley Town Council and Oxfordshire County Council and was instrumental in finding a suitable site and helped raise part of the finances to enable the current day pool to be built in Gillott’s Lane. Henley Swimming Club was reformed in 1977 when the new pool was opened. Des Hopkins became Henley Swimming Club’s first coach and subsequently the club president until 2003. Ray Gallagher took over in 1991 until 2013. Sarah Williams, our current head coach, took over in July 2013.